Guilt-ridden busy moms and dads take heart: Mothers – and fathers – across most Western countries are spending more time with their children than parents did in the mid-'60s, according to a University of California, Irvine study. And time spent with kids is highest among better-educated parents – a finding that somewhat surprised study co-author Judith Treas, UC Irvine Chancellor's Professor of Sociology. "According to economic theory, higher wages should discourage well-educated parents from foregoing work to spend extra time with youngsters," she said. "Also, they have the money to pay others to care for their children." Treas and co-author Giulia M. Dotti Sani, a postdoctoral fellow at Collegio Carlo Alberto in Turin, Italy, found that between 1965 and 2012, all but one of 11 Western nations showed an increase in the amount of time both parents spent with their kids. The study was published online in the August issue of the Journal of Marriage and Family. In 1965, mothers spent a daily average of 54 minutes on child care activities, while moms in 2012 averaged almost twice that at 104 minutes per day. Fathers' time with children nearly quadrupled – 1965 dads spent a daily average of just 16 minutes with their kids, while today's fathers spend about 59 minutes a day caring for them. These numbers include parents from all education levels. When the researchers broke out the 2012 data into two categories – parents with a college education versus parents without – they found quite a difference. College-educated moms spent an estimated 123 minutes daily on child care, compared with 94 minutes spent by less educated mothers. Fathers with a college degree spent about 74 minutes a day with their kids, while less educated dads averaged 50 minutes. Study findings were based on the Multinational Time Use Study Harmonized Simple Files, which focused on parents between the ages of 18 and 65 living in households with at least one child under the age of 13. From 1965 to 2012, the 122,271 parents (68,532 mothers, 53,739 fathers) in Canada, the U.K, the U.S., Denmark, Norway, France, Germany, the Netherlands, Italy, Spain and Slovenia were asked to keep a diary of all their daily activities. Researchers analyzed differences by randomly selecting one day from each diary and tabulating the amount of time recorded for both interactive and routine child care activities. "Time spent with children involved everything from preparing their meals and snacks to feeding and bathing them, changing diapers and clothes, putting them to bed, getting up in the middle of the night, unpaid babysitting, providing medical care, reading and playing with them, as well as supervising and helping with homework," Treas said. France was the only country that showed a decrease in mothers' child care time. The decline was not as steep for college-educated moms as it was for less educated French mothers, while for dads, both education levels saw an increase in parenting time. 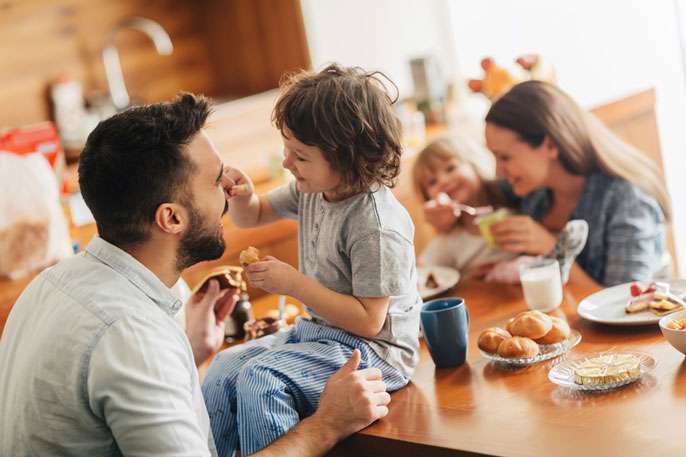 According to Treas, the study results – aside from France – are in line with an "intensive parenting" ideology that has become a cultural child rearing trend. "The time parents spend with children is regarded as critical for positive cognitive, behavioral and academic outcomes," she said. "Contemporary fathers – having more egalitarian gender views – want to be more involved in their children's lives than their own dads were. These beliefs have taken hold among the best-educated residents of Western countries and are also diffusing to their counterparts who have less schooling." As for the difference in France, Treas said, "No one is certain why the French are exceptional. Public spending on child care is fairly high in France, lightening parental responsibilities. Some experts speculate that the French simply believe children can accommodate successfully without parents making big changes to their lifestyles." iPads make it really easy to spend time 'with' your kids that's for sure.